This is Kellie McDougald, no stranger to arrest. This isn't a Halloween photo; this is one of her mugshots. I don't know Kellie McDougald of Kemp Texas, but she has defamed me hundreds of times. If you haven't been keeping up with Lawless America and me , you may be surprised to learn that a gang of cyberstalkers has viciously defamed William M. Windsor with thousands of false and defamtory statements online. 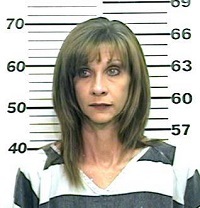 Kellie McDougald of Kemp Texas has published 1,315 comments on Joeyisalittlekid (through March 2014 and more since then) using one of her many aliases, Petunia Snodgrass. Let this serve as a Cease and Desist notice to all my cyberstalkers as well as a Correction and Retraction Request. Kellie McDougald uses the screen name “Petunia Snodgrass.” McDougald has been an active member of the JOEYISALITTLEKID club and a publisher of comments designed to generate more comments from others. On February 18, 2013 at 6:01 pm, “Petunia Snodgrass” published this about the Plaintiff on JIALK: “We have labeled him many things~scammer, con, liar....I see him as a predatory opportunist. He uses his ability as a predator, then his talents as a scamming, conning liar to chose just the right opportunity to take advantage his victims.” This is false and defamatory. This is just one of hundreds of false and defamatory statements by this pathetic cyberstalker. Through March 2014, there were over 320 articles filling over 7,000 pages, written by about 700 screen names, 99% of which are aliases or anonymous. Here are the published statements of Kellie McDougald on the Joeyisalittlekid website using the alias "Petunia Snodgrass" through March 2014. Statements are false and defamatory, and the mere publishing of the statements constitutes cyberstalking as Kellie McDougald has been asked to cease and desist many, many times. I have previously demanded, and demand again, an itemized correction and retraction request to each statement. These must be published in full on the Joeyisalittlekid website and everwyehere online that those articles, comments, and links appear. Kellie McDougald is reported to be a barmaid in Kemp Texas. I have sued Kellie McDougald in Windsor v. Joeyisalittlekid, et al, and I will be asking the court for a psychiatric evaluation of Kellie McDougald. I don't believe anyone in their right mind could do what this thing has done. As a member of the unprecedented case of defamation and conspiracy by this sleazy group of people, Kellie McDougald and all of her co-conspirators should each be found jointly and severally liable for the total amount of damages awarded by the jury. I anticipate that this could be one of the largest defamation awards ever -- certainly well in excess of $10 million. I am producing two expose documentaries about cyberstalking -- Slanderella and Slanderfella. Kellie McDougald will be featured in Slanderella.